Archangel and messenger of God. One of the three angels mentioned by name in the Catholic Bible. ...and on the Ulai I heard a human voice that cried out, "Gabriel, explain the vision to this man." When he came near where I was standing, I fell prostrate in terror. But he said to me, "Understand, son of man, that the vision refers to the end time." As he spoke to me, I fell forward in a faint; he touched me and made me stand up. "I will show you," he said, "what is to happen later in the period of wrath; for at the appointed time, there will be an end. "The two-horned ram you saw represents the kings of the Medes and Persians. The he-goat is the king of the Greeks, and the great horn on its forehead is the first king. The four that rose in its place when it was broken are four kingdoms that will issue from his nation, but without his strength. 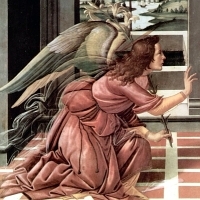 ...the angel of the Lord appeared to him, standing at the right of the altar of incense. Zechariah was troubled by what he saw, and fear came upon him. But the angel said to him, "Do not be afraid, Zechariah, because your prayer has been heard. Your wife Elizabeth will bear you a son, and you shall name him John. And you will have joy and gladness, and many will rejoice at his birth, for he will be great in the sight of (the) Lord. He will drink neither wine nor strong drink. He will be filled with the holy Spirit even from his mother's womb, and he will turn many of the children of Israel to the Lord their God. He will go before him in the spirit and power of Elijah to turn the hearts of fathers toward children and the disobedient to the understanding of the righteous, to prepare a people fit for the Lord." Then Zechariah said to the angel, "How shall I know this? For I am an old man, and my wife is advanced in years." In the sixth month, the angel Gabriel was sent from God to a town of Galilee called Nazareth, to a virgin betrothed to a man named Joseph, of the house of David, and the virgin's name was Mary. And coming to her, he said, "Hail, favored one! The Lord is with you." But she was greatly troubled at what was said and pondered what sort of greeting this might be. Then the angel said to her, "Do not be afraid, Mary, for you have found favor with God. Behold, you will conceive in your womb and bear a son, and you shall name him Jesus. He will be great and will be called Son of the Most High, and the Lord God will give him the throne of David his father, and he will rule over the house of Jacob forever, and of his kingdom there will be no end." But Mary said to the angel, "How can this be, since I have no relations with a man?" And the angel said to her in reply, "The holy Spirit will come upon you, and the power of the Most High will overshadow you. Therefore the child to be born will be called holy, the Son of God. And behold, Elizabeth, your relative, has also conceived a son in her old age, and this is the sixth month for her who was called barren; for nothing will be impossible for God." Archangel. Leader of the army of God during the Lucifer uprising. Devotion is common to Muslims, Christians and Jews, and there are writings about him in all three cultures. Considered the guardian angel of Israel, and the guardian and protector of the Church. In the Book of Daniel (12:1), Michael is described as rising up to defend the Church against the Anti-Christ. The feast of the Apparition of Saint Michael commemorates appearance of the archangel to a man named Gargan in 492 on Mount Gargano near Manfredonia in southern Italy. Gargan and others were pasturing cattle on the mountain; a bull wandered off and hid in a cave. An arrow was shot into the cave, but it came flying back out and wounded the archer. The cowherds went to their bishop who ordered three days of fasting and prayer to seek an explanation for the mystery. At the end of the three days Michael appeared to the bishop and requested a church built in the honour of the Holy Angels in the cave. If you find medals or holy cards with 'relics' of Michael, they are probably rock chips from the cave, or pieces of cloth that have touched it. Archangel. One of the three angels mentioned by name in Scripture, and one of the seven that stand before God's throne. Lead character in the deutero-canonical book of Tobit in which he travelled with (and guarded) Tobiah, and cured a man's blindness; hence his connection with travellers, young people, blindness, healing and healers. Traditionally considered the force behind the healing power of the sheep pool mentioned in John 5:1-4. Born to a poor farming family. Entered seminary at age 18, and was ordained in the archdiocese of Milan, Italy on 19 September 1925. Assigned to a parish in Vedano Olona, Italy. Imprisoned for four months, having been falsley accused of planning an attack on a local Fascist official. Re-assigned to the Shrine of Our Lady of Miracles in Saronno, Italy in 1929 where he worked as a youth minister. Re-assigned to the parish of San Giovanni in Lecco, Italy in 1936 where he continued his work with youth and famillies. Known for his work with the poor, the sick, and the unjustly accused and persecuted. Founded the women's Istituto Secolare delle Piccole Apostole della Carità (Secular Institute of the Little Apostles of Charity) in 1937. He and the women of the Institute spun off the "Our Family" Association to provided education and medical help for poor and disabled children. Both groups continue their good work today, and the Little Apostles have spread from Italy to Sudan, Brazil, Ecuador, China, Morocco, and Palestine. Father Luigi became the model of a parish priest, working as a spiritual guide for his parishioners, and through families for a return to the love of the faith and of each of other found in the original Christian communities. French nobility, born to Andrew, Lord of Montmirail and Ferté-Gaucher, and Hildiarde d'Oisy. Trained in religion by his mother, and secular science by his schools. Soldier. Friend of Philip Augustus, later King of France. Married to Helvide de Dampierre, and father of several children. Spent time in the French court, leading a dissolute life. At age 30 he met Jobert, Prior of Saint-Etienne de Montmirail, whose intervention and counsel caused his conversion. John built a hospital with special facilities for lepers, cared for the poor, practiced self-imposed austerities, and spent whole nights in prayer. He finally obtained his wife's permission to enter religious life; he provided for her and the children, gave the remainder of his wealth to the poor, and became a Cistercian monk at Longpoint abbey. There he gave himself so wholly to prayer and penance; had to be reprimanded for going to excess in his self-imposed austerities. Harassed and insulted by relatives and former friends. Pope Leo XIII granted a special office in his honour for the diocese of Soissons. Entered the Jesuit noviate in Paris, France, but his deafness prevented his joining the order. He studied medicine, and in 1639 offered to work as a medic for the Jesuit missionaries in America. Missionary to the Hurons, working as a donné, a layman who worked without pay. Worked in a hospital in Quebec, Canada in 1640. Assistant to Saint Isaac Jogues on his missionary travels. Captured and tortured by Iroquois, enemies of the Huron, for making the sign of the cross over a child's head, which was mistaken for some type of curse. While they were in captivity, Father Isaac received Rene into the Jesuits as a religious brother. First martyr in North America. His death by tomahawk in the head led to his patronage of people who work with or receive anasthesia. Student at the minor seminary of the Missionaries of the Sacred Heart in Canet de Mar, Spain, and then joined the congregation on 30 September 1928. Ordained a priest on 6 April 1935. Taught Latin and served as treasurer of the Missionaries‘s school. Known for his exceptional physical strength, he was a father figure to many of the boys in his school. He was captured by Communist militia on 21 July 1936 when the militia men took over the school. He and several brother Missionary priests escaped on the night of 3 August 1936, and tried to make it to France, but were re-captured in the mountains on 28 September 1936, taken by bus to the Pont de Ser, and executed for the crime of being a priest. Martyred in the Spanish Civil War. Hermit. Friar Minor Conventual in 1440. Priest. Preacher in Ukraine, Moldavia and Belarus. Often a local superior, and once led the Franciscan custody headquartered in Lvív, Ukraine. In 1463 he joined part of the Observant Franciscans, who observed their Rule very strictly. Helped repel a Tartar attack on Lvív in 1474. John's life was characterized by poverty, obedience, asceticism, and devotion to Our Lady. Sought to reconcile schismatics to the Church. Blind at age 70, he continued his ministry as preacher and confessor. Son of Guy de Chatillon, Count of Blois, and Margaret, sister of King Philip VI of France. Charles felt a call to be a Francescan friar, but political duty kept him in secular life. Married Joan of Brittany in 1337, and became Duke of Brittany which involved him in disputes political and military. Soldier. Captured Nantes, France. Attended Mass daily. Founded religious houses, helped the sick and poor. Made a barefoot pilgrimage to Rennes. In 1346 he was defeated and lost his dukedom to John de Montfort who imprisoned him and sent him to England to languish in the Tower of London until ransomed and released nine years later in 1355. Charles then spent nine more years unsuccessfully fighting to regain his dukedom before dying in battle. Along the way he founded several religious houses, and was known for his Christian treatment of prisoners. Lifelong layperson in the diocese of Lleida, Spain. Youngest of three children, his father died when Francesc was an infant. Educated by Marists in Lleida, Catalonia, and then by Jesuits at the Chemical Intitute in Barcelona, Spain. During his college years in Oviedo, he became politically active, and continued working with the Jesuits. Member of the Federation of Young Christians of Catalonia. Member of Catholic Action. Worked as a chemist in Lleida. Engaged to Maria Pelegri. Drafted into the army just before the start of the Spanish Civil War. Imprisoned on the night of 21–22 July 1936 by anti–Catholic militiamen. Dragged before a “people’s court”, he refused to renounce his faith. Martyr. An excellent student all his life, he was educated at Oxford. Studied in Paris, France from 1320 to 1326. Returning to England, he lived as a hermit on his family's estate. Some family members threatened to have him committed as mentally ill, and he moved to the estate of his friend and college classmate John Dalton of Pickering in 1326. Visionary and mystic. After several years of prayerful solitude, he began wandering England. Spiritual director for a community of Cistercian nuns at Hampole, England. Noted spiritual writer. Studied at the University of Paris. Cistercian monk at Langonette Monastery in France in 1144. 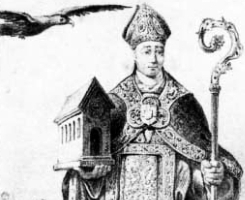 Abbot of the house in 1176. Founding abbot of Carnoet Abbey in Brittany. When the woods around the house were threatened by aggressive wolves, Maurice reminded his brothers that wolves were God's creations, too, but for their protection he prayed for help, some wolves died, and the attacks ceased. Son of duke Burhard II of Swabia. Educated at Einsiedeln, Switzerland. Monk of Einsiedeln. Hermit on the island of Ufnau in Lake Zurich where his mother had lived in seclusion following her diagnosis with leprosy, and where he built a church dedicated to Our Lady. Dominican priest. Missionary to Japan. Arrested for his faith in Okinawa, and martyred soon after. Dominican priest. Missionary to Japan. Arrested for his faith in Okinawa. Martyr. Virgin martyr, executed with a group of fellow Christian in Armenia. She and her fellow victims are honored as the first Christian martyrs of Armenia. Many highly fanciful tales have grown up to fill in the blanks in her life story. Married. A widower, he founded a monastery in Mettlach, Germany and became a monk there. Bishop of Trier, Germany. ArchPriest in Pontecorvo, southern Italy. Around 1137 he built a church dedicated to an apparition of Saint John the Baptist. Persian noble. Related to King Shapur II. Married to Saint Casdoe. Martyred for refusing to deny Christianity during the persecution of Shapur II. Repentant prostitute. Convert. Tortured and martyred for refusing to sacrifice to Roman idols during the persecutions of Agrippa. May have been the son of Saint Dadas and Saint Casdoes. Martyred with them for refusing to deny Christianity during the persecution of Shapur II. Hermit in Palestine who lived among several groups of hermits, and was renowned in each one for his holiness. Persian noble woman. Married to Saint Dadas. Martyred with him and Saint Gabdelas, who may have been their son, for refusing to deny Christianity during the persecutions of Shapur II. Benedictine monk at the abbey of Sainte-Claude in the Jura Mountains. Worked with Saint Joan of Arc. Relative of King Shapur II who had him executed for his faith. Martyr. Bishop of Auxerre, France. Martyr. Monk who evangelized the area of Eichstätt, Germany in the 8th century. Maiden martyred in the persecutions of Shapur II. Three Christian men murdered in Thrace for their faith. They are - Eutychius, Heracleas and Plautus.